Aidan 9/4 to beat his own world record in 2018 and were all set for a bumper season let the good times roll AGAIN!!!! Highland Reel joins The Worlds all time top 20 money earners list. 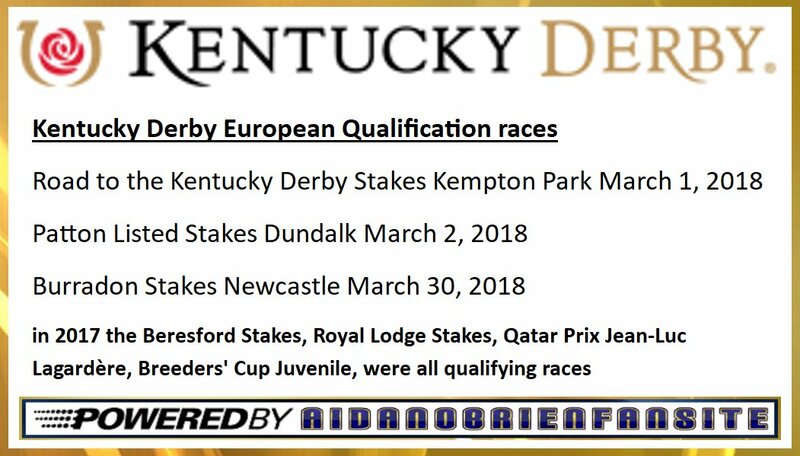 Great to see there is a new European qualification route to the Kentucky Derby A route we more than likely will see Mendelssohn go down in order to qualify for the run for the roses on May 5th. He already gained points from his Breeders Cup Juvenile victory . IRELAND HAS A G1 SPRINT AT LAST - Great news the Derrinstown Stud Flying Five Stakes at the Curragh on Longines Irish Champions Weekend has been upgraded to Group One status this is fantastic news. Clear Skies advertised her claims when stylishly justifying 11/8 favouritism in the Phone Alarms Handicap at Dundalk. It was so easy for the Sea The Stars mare and Donnacha O'Brien's mount eventually beat Sharjah by five and a half lengths. O'Brien's father Aidan trains the now five time Dundalk victor for J P McManus. "She's a fair filly and we just had to get her head right more than anything. 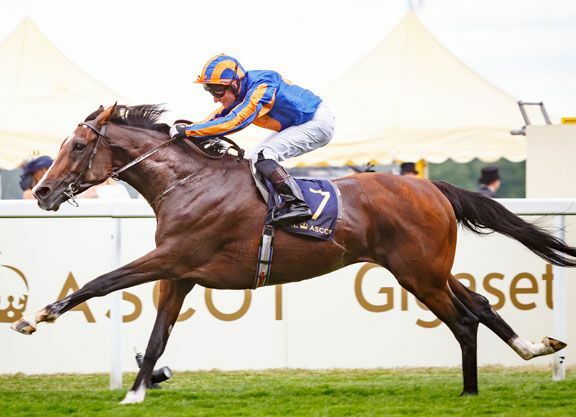 She's got it all together now and has a fair bit of ability," said Donnacha O'Brien. "She was nice and relaxed in the race and before it as well. She just didn't get home over two miles the last day." Aidan O’Brien is 9-4 to break his world Group/Grade One record tally this year after US Navy Flag was confirmed as the Irish trainer’s 10th European juvenile champion. Tuesday’s publication of the 2017 European Thoroughbred Rankings saw US Navy Flag – winner of both the Dewhurst and Middle Park Stakes during a busy 11-race two year old campaign – join a long list of previous O’Brien stars who have topped the juvenile rankings. For good measure Ballydoyle’s Cheveley Park Stakes winner Clemmie headed the fillies list for 2017 and the huge strength in depth of O’Brien’s classic squad for 2018 is emphasised by him having 15 of the top 45 rated juveniles of 2017. They include the Racing Post Trophy winner Saxon Warrior whose Doncaster success saw his trainer break Bobby Frankel’s old record of 25 Group/Grade One victories in a calendar year. Highland Reel’s Hong Kong Vase victory last month saw O’Brien set a new record mark of 28. The classic potential lurking within the Ballydoyle squad for this year however means the RaceBets firm reckon it’s just 9-4 about him improving that mark in 2018. “The fact that US Navy Flag and Clemmie were respectively crowned champion two-year-old colt and filly from last year means the omens are terrific for another stellar season for O’Brien in 2018,” said spokesman, Joseph Burke. “He trains the top two in the betting for the first four British classics of 2018. The top three, and indeed the only horses trading at under 10/1 for the 2000 Guineas, are based in Ballydoyle. The first three in the market for the 1,000 Guineas (and the only horses trading at less than 14/1) are also trained by O’Brien. Nowhere is his dominance more prevalent however than in the Epsom Derby where five of the first six in the market are in O’Brien’s care,” he added. Aidan O'Brien has entered six horses in the Betway Winter Derby at Lingfield on February 24. The Ballydoyle handler last had a runner at a British all-weather track in 2002 but can choose from Deauville, Idaho, Lancaster Bomber, War Decree, War Secretary and Clear Skies in the Group Three. The Labour Court has rejected an appeal brought by Ballydoyle, the State’s leading racing stables, against compliance notices served by the Workplace Relations Commission over alleged excessive working hours on the part of some staff. In the course of an inspection in May 2016, a Workplace Relations Commission inspector found a number of breaches of the Organisation Working Time Act. These involved the failure to provide sufficient breaks and rest periods for a number grooms and exercise riders. In February last year the inspector issued four compliance notices against Ballydoyle in relation to his findings. The inspector maintained there had been a failure to grant daily rest periods of 11 hours to three named employees; a failure to grant three employees a weekly rest period of 24 hours in each of four consecutive weeks; a failure to grant four named employees two rest periods of at least 24 consecutive hours each in a week following a week in which they had not received a single weekly rest period of 24 consecutive hours; and a failure to grant four named employees a weekly rest period that included a Sunday in any four specified weeks in May 2016. Last summer, Golden Dale Unlimited Company, trading as Ballydoyle Racing, brought an appeal to the Labour Court against the compliance notices served on it by the inspector. Ballydoyle contended it was exempt from provisions of the legislation because its staff were engaged in agricultural activities. Ballydoyle also argued that the nature of its business meant that grooms and exercise riders were involved in ensuring the continuity of production, and that the rate of production would vary from time to time. Trainer Aidan O’Brien gave evidence to the Labour Court during the appeal that it was very important in the continuity of training horses that a strong relationship developed between an individual horse and its exercise rider and groom. Asked under cross-examination whether additional grooms and exercise riders could be recruited so all staff could receive their statutory daily and weekly rest period, Mr O’Brien said this could be done but it would increase the health and safety risk for horse and worker because the same “telepathic” relationship would not be present between the horse and those attending the animal. In his finding, Labour Court deputy chairman Alan Haugh said Ballydoyle had sought to advance an interpretation of the word “agriculture” that was far broader than the ordinary dictionary meaning. The Labour Court also found in its conclusion that Ballydoyle had failed to demonstrate to its satisfaction that workers, who were the subject of the compliance notices, were “directly involved in ensuring the continuity of production or the provision of services”. 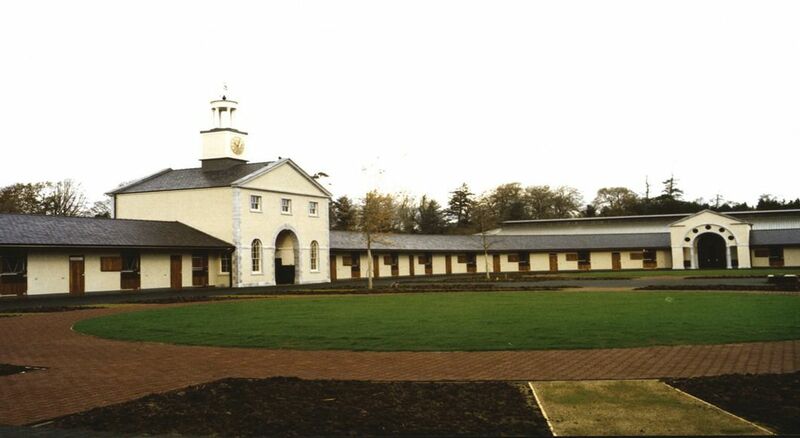 The court did not accept that the extremely broad definition of agriculture contended by Ballydoyle had any application in the context of construing a derogation from European law. Ballydoyle is the racing arm of Coolmore Stud’s bloodstock operation, and Coolmore on Friday night declined to comment on the court’s ruling. Horse Racing Ireland’s chief executive Brian Kavanagh said the outcome of the appeal was of “very serious concern” for racing. Mr Kavanagh last year said that implementing strict employment laws outside the definition of agricultural work would make operations “impossible” within the bloodstock industry. According to TDN statistics, Galileo’s runners earned £15,145,613 in Europe in 2017 – more than double that of his nearest pursuer on £6,956,352. Happy Christmas from the AOBFS Team it was quite a first year at stud for Camelot and there is plenty more to come in 2018. I think his progeny will flourish at 3.